"A tense psychological thriller that will leave you gasping for breath as you race to the very last page." --Gretchen McNeil, author of Ten "An awesome, creepy book that reminds me of my favorite cult films while still being surprising." --HelloGiggles.com "Compelling. . . . This absorbing examination of a cult focuses on a teenage girl who begins to doubt their leader." --Kirkus Reviews, Starred "I highly recommend Gated to fans of contemporary fiction with a twist. This one has a bit of everything--mystery, intense action, real life issues, and romance." --My Book Addiction (blog) "After the last page is turned, the question will linger: 'Could I ever be deceived like this?'" --SLJ "Highly recommended for fans of YA thrillers and contemporary fiction." --A Dream Within a Dream (blog) "Every once in a while a book comes along that leaves you reeling. Speechless. Shocked. Nothing you say will do it justice. 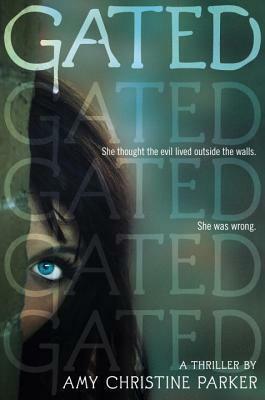 Gated is that book. Chilling, horrifying, but beautiful. A MUST read." --Lilybloombooks.com "Action-packed and full of suspense. . . . It's new and fresh, a step away from everything that's out there right now." --Me, My Shelf, and I (blog) "A complex, intriguing tale rooted in real-world events." --Publishers Weekly "Mysterious, entrancing and dark, Gated brings in just the right amount of paced storytelling with the edge-of-your-reading-seats sense of suspense." --TeenReads.com "An absolutely enrapturing book . . . I couldn't put it down." --In Libris Veritas (blog) An entertaining and unique entry in a sea of generic YA novels." --Fiction Frenzy (blog) "If you need a summer thriller read with a smartly woven plot and a lamb-to-lion main character, then this book is for you." --Great Imaginations (blog) "An absolutely fascinating read with an original concept and an absolutely brilliant villain! Different with just the right touch of chilling." --Fiction Freak (blog) "Entertaining throughout."